Nonfarm payroll employment rose by 120,000 in March, and the unemployment rate was little changed at 8.2 percent, the U.S. Bureau of Labor Statistics reported today. The civilian labor force participation rate (63.8 percent) and the employment-population ratio (58.5 percent) were little changed in March. 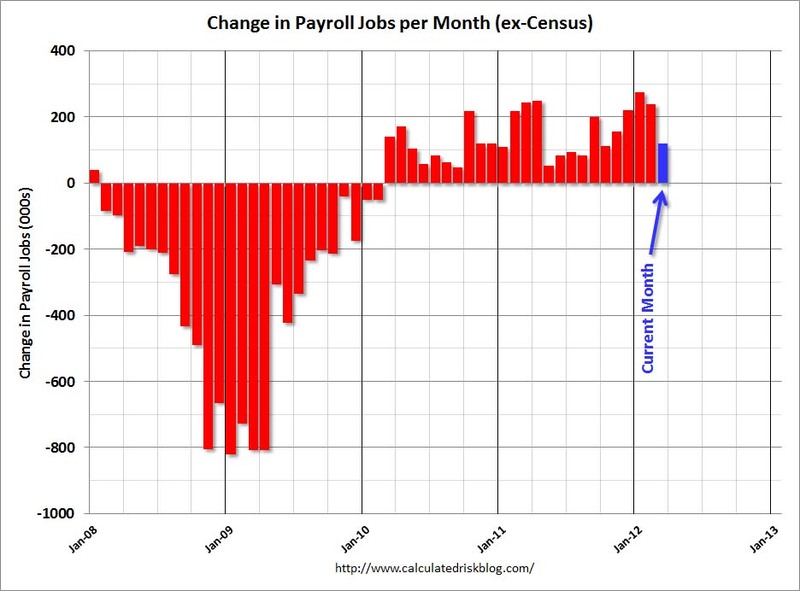 This graph shows the jobs added or lost per month (excluding temporary Census jobs) since the beginning of 2008. Job growth started picking up early last year, but then the economy was hit by a series of shocks (oil price increase, tsunami in Japan, debt ceiling debate) - and then growth started picking up again. 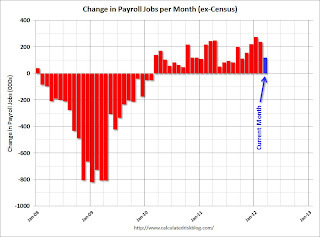 This is only one month, but the concern is job growth will slow again. 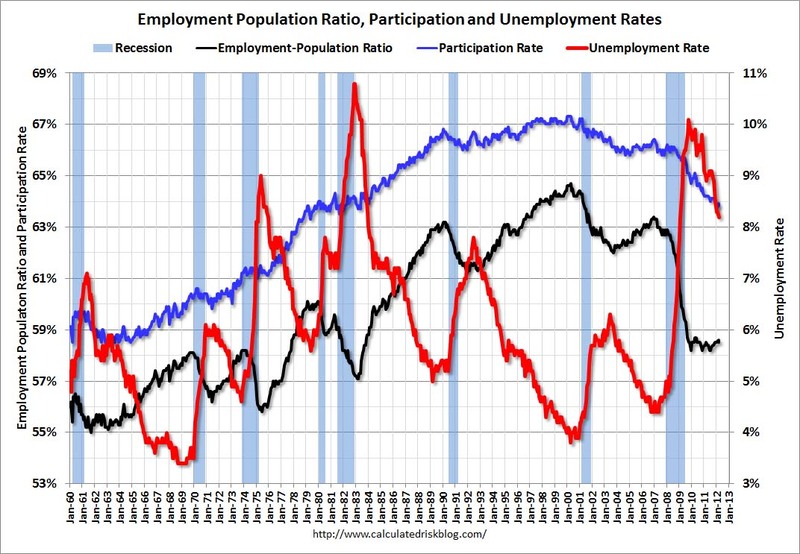 The second graph shows the employment population ratio, the participation rate, and the unemployment rate. The unemployment rate was declined to 8.2% (red line). The Labor Force Participation Rate decreased to 63.8% in March (blue line). This is the percentage of the working age population in the labor force. 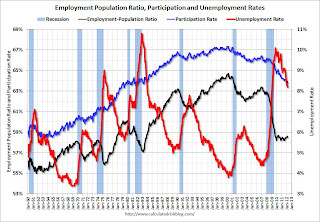 The participation rate is well below the 66% to 67% rate that was normal over the last 20 years, although most of the decline is due to demographics. The Employment-Population ratio decreased slightly to 58.5% in March (black line). 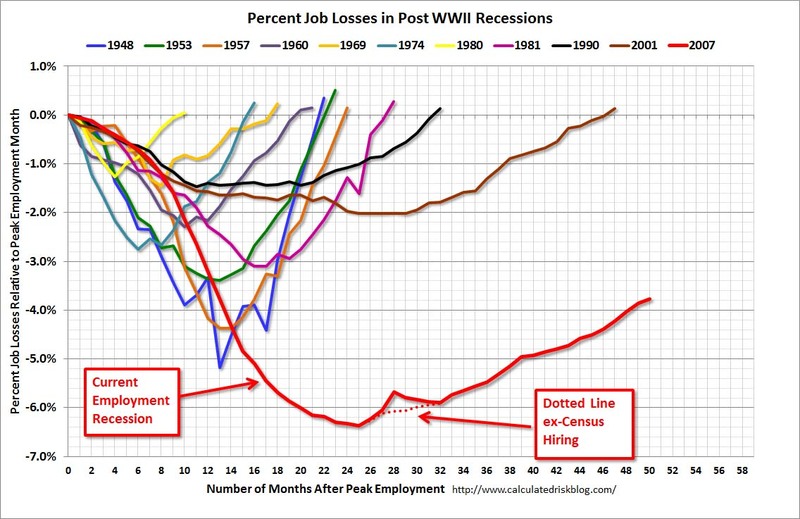 The third graph shows the job losses from the start of the employment recession, in percentage terms. The dotted line is ex-Census hiring. 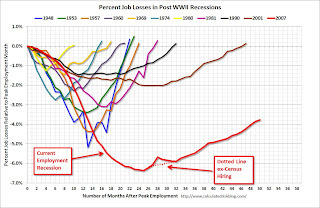 This shows the depth of the recent employment recession - much worst than any other post-war recession - and the relatively slow recovery due to the lingering effects of the housing bust and financial crisis.